@JRown32 / TwitterThe Baltimore Ravens thought they had forced overtime against the New Orleans Saints, right until sure-footed kicker Justin Tucker missed the first extra point of his career. The Baltimore Ravens comeback came up short in unbelievable fashion on Sunday. After driving the field for what should have been the game-tying touchdown, kicker Justin Tucker missed the extra point, leaving the Ravens just short of completing their comeback. It was the first missed extra point of Tucker’s storied NFL career. The Baltimore Ravens were right where they wanted to be. After getting the ball back down a touchdown, Joe Flacco and the Ravens offence drove the field for a potential game-tying score against the New Orleans Saints. With just 14 seconds remaining, Flacco found receiver John Brown in the end zone, and everyone prepared for overtime. All that was left was for Justin Tucker, the most accurate kicker in NFL history, to send home the extra point and tie everything up at 24-24. As the commentators ominously noted, Tucker had never missed an extra point in his career, going an impressive 222/222 up until that point. But then, the unthinkable happened. Tucker shanked his kick wide right. Joe Flacco finds John Brown for the Ravens TD. 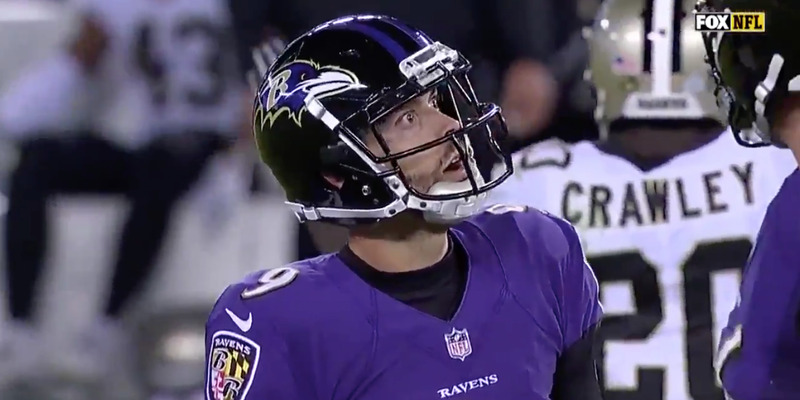 Justin Tucker's extra point attempt is NO good. Saints leading 24-23 with :24 left to play. It’s possible that no one was more shocked with the miss than Tucker himself, who couldn’t help but look bewildered as he wondered what went wrong. Another angle of the kick makes clear just how wild a trajectory Tucker’s kick took, hooking hard to the right to force the fateful miss. Kicking in football is never a sure thing, but Tucker was about as close as humanly possible. Not only had he never missed an extra point, but Tucker had also never before missed any kick inside 33 yards in his seven years in the NFL. Unfortunately for the Ravens, there’s a first time for everything, and Tucker’s unexpected miss left the Ravens just short of the comeback win, falling to the Saints, 24-23.